Miranda Green: The rest of the world's economy is three times bigger than that of the US. 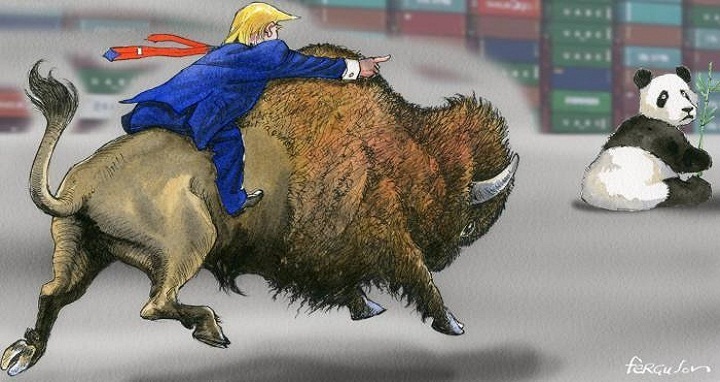 And in his column this week Martin Wolf examines the risks Donald Trump is running in escalating his trade dispute with China in a way that could end up uniting all other regions against America. The pure bilateralism prefered by the Trump administration in pursuing its quest for a more favourable trade balance heightens the danger, Martin argues, of damaging the US itself, trade, the world economy and international relations. He also points out some basic flaws in the US plan to "win" the trade dispute: for example, China cannot deliver bilaterally balanced trade because it is unable to force Chinese people to buy goods they do not want. These are, he says , primitive ideas for the president of the most sophisticated country on earth. Sarah O'Connor writes on why measures to ensure fairer tipping for hospitality staff can still be a cover for low pay. Tony Barber argues that Europe's insurgent populists will not find it easy to secure a victory in next May's elections to the EU parliament. David Gardner examines the options for Turkey's president Erdogan as he faces crucial decisions over Syria, and relations with the EU, US and Russia.